If you own an antenna fed with coax, you need RF chokes on the feedline! Using a balun with adequate RF choking impedance will improve the performance of your antenna, prevent pattern distortion, and prevent RF coming down the feedline, which can cause RFI. Many balun manufacturers either don’t make baluns with enough choking impedance, or are overcharging for a product that can easily be made by the ham (and much more effective!). 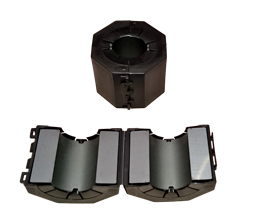 Ferrite is a ceramic consisting of iron and metal oxides having high permeability. When a conductor is passed through the center of a ferrite bead, the impedance goes up with the SQUARE of the number of passes through the center. To achieve the same amount of choking impedance of a toroid with a few turns through the center, a “string of beads” choke can require 30, 40, 50 or more beads! 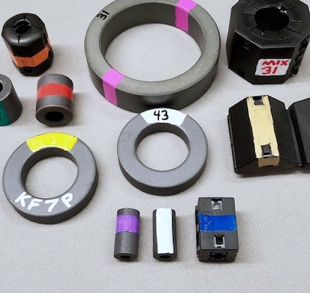 Ferrite is made in different formulas, called mixes. The mix used will determine the best choking impedance for the desired frequency range. Mixes 31 and 43 are best for HF use (31 is better for the low bands, with mix 43 having a slight advantage from 14 to 30 MHz). I currently stock mix 31, 43, 61, 77, and 73 ferrite. Let me know if you are looking for something in particular. Chris at KF7P dot com. 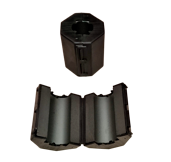 Check out our TECH page for lots of information on ferrite material and how to properly use it. 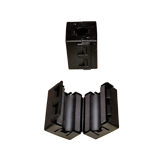 Below: Comparison photo shows the ferrite we stock to use a a size reference. NEW! View our new introductory video to ferrite! Useful baluns and chokes for coax. Large opening allows several passes through center without taking connectors off. Often a stack of several of these are needed to achieve target impedance. Specify quantity after adding to cart. Useful for small cables or one pass with RG8 size coax (43, 31, and 61 beads). Small beads (61 and 73) only fit small coax. Specify quantity after adding to cart. I put one of these excellent choke kits at my transceiver and another "pretty good" choke at the feedpoint of my G5RV Jr. It knocked a good 2 or 3 s-units off of the "band noise" I was experiencing. 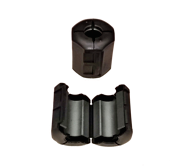 The product is well made and easy to put together, and the ferrite components are top-notch. I will be ordering more. User Reviews: What are other hams saying about these products? Love the big mix 31 Ferrite Beads...They really do the trick. Love Big Mix 31 works great !! Made a big difference on my transceiver. Purchased the "Biggest Clamp-On" 220-31 for common mode rejection. Both the price and service were excellent; Very competitive. For easy assembly without taking connectors off or disconnecting cables. “Biggest Clamp On” is roughly equivalent to three toroids above, and easier to use. Specify quantity after adding to cart. Note: This is one tiny ferrite bead, only fits over RG58, RG174, or RG303. At least 50 beads are needed to provide an acceptable level of choking impedance. MONSTER toroid great for choking large cables with connectors that cannot be removed. Picked up an excellent choke kit for the feedline and biggest clamp on for the power cable. They work great, shipped fast, Thanks! These mix 31 snap on beads that Chris sells are the best. He packs them up well and shipping is fast! The largest Mix 31 snap on bead can fit 4 turns of LMR400 Flex through it no problem. Perfect for getting rid of my 10 meter common mode interference. Prices are also better than all of the other suppliers I checked. .505” beads. I was shocked at how much this arrangement reduced the noise floor in my receiver...6dB or more on 40 meters. I’ll be ordering more to experiment with. KF7P does an excellent job of packing and ships very quickly,..highly recommended. I have successfully stopped all RFI from my shack with these snap on chokes. They are the best I’ve seen, and Chris has the best prices I’ve found on these essential parts for the shack. Plus great packing and fast shipping. Highly recommended. Fits small coax: RG58, RG8x, RG400, RG142, etc. Customize your ferrite for easy identification with our new marking pens below! 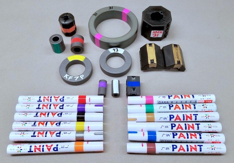 Customize your ferrite for easy identification with our marking pens! Ferrite comes in different formulas or “mixes”, and it is almost impossible to tell different mixes apart. Be sure to get some of these inexpensive marking pens and customize your ferrite so you know which type to use. White can be used as a base for writing on with black (or other colors), or a color code chart can be used in a way similar to resistor color codes. 12 colors available. 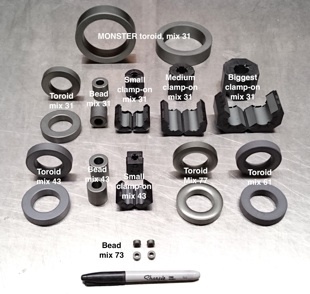 Looking for choke kit assemblies? Visit our new RF choke page.